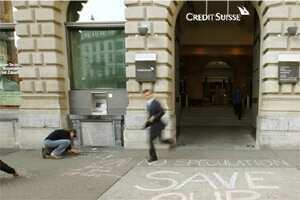 A man runs past demonstrators painting slogans on the ground in front of Swiss bank Credit Suisse in Zurich on 24 October 2011. Reuters. Zurich: Swiss bank Credit Suisse announced another 1,500 job cuts on Tuesday and said it would cut back high-risk fixed income assets to meet tough new capital rules after its investment bank posted a third-quarter loss. Banks are shedding jobs worldwide as stricter regulations and a tough third quarter for trading income take their toll on investment banking divisions in particular. Credit Suisse had said in July it would cut about 2,000 jobs out of a total staff of about 50,700 as it targeted 1 billion francs in annual cost savings. It said the new cuts should bring those cost savings to 2 billion francs by 2013. The cuts will further reverse chief executive Brady Dougan’s post-crisis hiring spree focused on fixed income, the area hit most by the new market downturn this year. Chieff financial officer David Mathers told a conference call for journalists the job cuts would fall evenly across developed economies and would hit all its businesses, although less so its core private banking business. Cheuvreux analyst Christian Stark said stipping out the US litigation provision; the underlying net profit looked about 10% below expectations. “It’s not a disaster as the measures they are taking on costs and RWA look encouraging." Switzerland’s other big bank, UBS, said in August it was slashing 3,500 jobs to shave 2 billion francs off annual costs and is expected to make more cuts at an investor day on 17 November when it announces an investment bank overhaul. Credit Suisse said net profit rose 12% percent to 683 million francs, missing a Reuters poll estimate for 1.1 billion francs. In line with other banks this quarter, the Credit Suisse numbers were flattered by a 1.336 billion franc accounting gain on the value of its own debt -- which occurs because the bank could profit from buying back its own bonds at lower levels. Stripping it out, underlying net profit was 441 million francs, above average analyst expectations for 258 million. The investment bank reported a pre-tax loss of 190 million, down from a 231 million profit in the second quarter, as it was hit by challenging market-making conditions and continued low client activity as the macroeconomic climate deteriorated. “We believe subdued economic growth and the low interest rate environment and increased regulation that we are seeing may persist for an extended period," Dougan -- the former investment bank CEO -- said in a statement. “We may well continue to see continued low levels of client activity and a volatile trading environment." Net new assets in private banking were 7.4 billion francs, also missing average analyst forecasts for 9 billion francs. Credit Suisse said it had taken a provision in the quarter of 295 million francs for settling a US investigation into the bank helping wealthy Americans dodge tax, which is still ongoing although the Swiss government seems close to a deal. CFO Mathers declined to comment on the timing of any deal, noting the issue was subject to government-to-government negotiations, but said the bank had to take the provision as an accounting related issue. The bank also took a provision of 183 million francs for a German fine to settle a separate tax investigation it had already announced in September. The bank said it was responding to new capital rules by targeting a 50% cut in risk-weighted assets in fixed income by 2014 and planned to more closely align investment banking with its private banking and asset management units. It also plans cost saving measures in its private bank with the goal of increasing its contribution to group pre-tax income by 800 million francs, excluding market induced growth, by 2014. The bank said it would allocate more resources to faster growing markets like Brazil, south-east Asia, greater China and Russia, which it expects will account for a quarter of group revenues by 2014 from 15 percent now. Mathers said the bank made a quarterly accrual in line with its 2010 dividend payment of 1.30 francs, but would only take a decision on the final 2011 figure after the year closed.